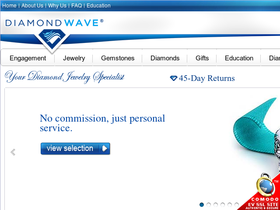 For quality diamonds at low prices, shop DiamondWave, online at DiamondWave.com. DiamondWave is committed to offering great value in quality diamond products, and DiamondWave handpicks the mountings to ensure top craftsmanship with every product. DiamondWave.com offers diamond engagement rings, wedding rings, diamond earrings, classic styles, vintage styles, a large collection of pearl jewelry, gemstone jewelry, and more. DiamondWave also gives customers the option of building their own ring, for an extra unique touch. But before you shop, get all the latest DiamondWave.com discounts, DiamondWave promotions, and DiamondWave coupon codes found here at RetailSteal.com. DiamondWave offers a free standard shipping option for customers within the U.S. and to APO/FPO addresses. DiamondWave also offers expedited shipping and international shipping. See site for more information. Enjoy a $50 discount from DiamondWave.com. Use coupon code with purcahses $500+. Save $25 on your purchase from DiamondWave. Click here and use coupon code with purchases $300+. DiamondWave offers free ground shipping on all orders within the United States. Click here to shop and save. Save up to 50% or more on pearl jewelry from DiamondWave. Click here to shop. DiamondWave offers diamond jewelry with discounts up to 40% compared to retail. Click here to shop now and save. Enjoy monthly special offers from DiamondWave. Click here and sign up for the newsletter to save. Build your own ring at DiamondWave.com. Click here to create a personal ring for any occasion. Click link and peruse selection of weekly specials online at DiscountWatchStore.com and you could save up to 60%. Enjoy free 2 day shipping from DiscountWatchStore.com when you spend $149.99 or more. Click link to start shopping. Save up to 90% on the Deals of the Day online at DiscountWatchStore.com. Click link to browse selection. Enjoy savings of up to 80% off when you shop clearance watches online at DiscountWatchStore.com.